Who is better suited to explain a tokoyama's duties and daily life than a tokoyama himself? Harumi Hotta has inteviewed Tokosei, the tokoyama affiliated to Kiriyama beya*, for Le Monde du Sumo. In addition to answering our questions, he also demonstrated how a chon-mage is made. Tokosei, like many of his fellow tokoyama, also works in other heya, including ozeki Kaio's Tomozuna beya. How are tokoyama usually recruited? There are several ways. Some people are introduced by "Koenkai" (official supporters), some enter by themselves. Some wanted to become a rikishi, but weren't tall enough. 15-18 years old. 18 years old is the upper limit to entering this world as a tokoyama because people learn quickly at this age. Why (and when) did you decide to become a tokoyama? I was a rikishi first. I became a rikishi when I was 15 years old. When I was seriously injured, I was invited to become a tokoyama. After that injury, I thought it would be better for my life than being a rikishi. I was then 17 years old. So people can transfer from a rikishi to a tokoyama. Can tokoyama become a rikishi? A tokoyama used to be able to become a rikishi, however, now it seems impossible. Now noone transfers to being a rikishi from being a tokoyama, therefore, I don't know if they can. Usually,a tokoyama is not big enough to become a rikishi, therefore, it would probably be difficult. Is there a special school for tokoyama? There is no institution or school as such. A tokoyama enters a heya. If there is a senior tokoyama in the heya, then he is taught by the senior. If there is not a senior in the stable, then he would go to a tokoyama in another heya in the same ichimon. In fact, the seniors don't teach the juniors much. They say, "Look and learn." From the first, you are told, "Try it." Of course, a senior teaches him how to hold a comb, etc. He first does the hair for the lower ranked rikishi. Even if he asks, "How do I do this part of the hair? ", the senior will not teach him and just says, "Look and learn." So, it is practice, not theory. How many years are necessary for a young tokoyama to be able to execute his first oicho-mage? It depends on their effort and talent - Everyone is different. When we enter the heya, "minarai-kikan (Probation)" is for 6 months to 1 year. We soon start making normal mage. Usually it takes 3-5 years before we can start making an Ooicho mage. It took me five years for me to be able to arrange an Ooicho. My senior was in hospital. A substitute did the Ooicho mage for the sekitori rikishi - Ishinriki-zeki. Then, the substitute got a cold. So, one day, I was appointed as his tokoyama, even though Ishinriki-zeki was from another stable. I had to do an Ooicho for him. The first time I arranged an Ooicho, I thought, "Is this a really an Ooicho?? (laugh)" After a while, I was appointed to do the Ooicho of Wakasegawa-zeki who was in the same stable as me. I was struggling to arrange a good Ooicho, so I practised a lot with lower ranked rikishi. Do tokoyama have their own way to make an oicho-mage, or are all oicho-mage identical? Basically, they are the same. However, they look different depending on the tokoyama, the ichimon, and the rikishi - their quantity and quality of hair. Therefore, all rikishi have their own Ooichos. It looks the same, but something is always a little different. How do tokoyama manage to make an oicho-mage for rikishi who are losing their hair, like Hakurozan-zeki? It is basically the same, however, the different result depends on whether a rikishi has a lot of hair or not. Ideally, we want a rikishi to have hair all around his head. So, it is difficult to do up a rikishi who has no frontal hair. But a tokoyama gets used to doing it. But if I was suddenly appointed to arrange Hakurozan-zeki's Ooicho today, I think it would be difficult. What happens when a rikishi loses all his hair? Does he get a hairpiece? To be honest with you, I don't know. Probably, the rikishi would retire. There is no rule that they have to retire if they lose all of their hair. However, a sekitori would probably retire if he lost all of his hair. I don't think he would use a hairpiece. How many chon/oicho-mage do you make in general, in a single day? It depends on the tokoyama. Basically, tokoyama work for their own heya. However, (like for me) if there are few rikishi in the tokoyama's heya, then, he will go to other heyas where there are no tokoyama. If there are 20 rikishi in their own heya, the tokoyama will only do the hair for their heya. I currently do 10 to 15. There is no rule how many mage each tokoyama has to do in a single day. What are the differences in making a chon-mage and an ooicho-mage? Which one do you prefer to make? I don't have any preference. I like both. I am more tense doing an Ooicho than doing a normal mage. I normally arrange Ooichos at Honbasho. Therefore, many seniors will watch me. Also, the sekitori is concentrating on his fight later that day. I am tense in that kind of atmosphere. A very experienced senior tokoyama can find out if a rikishi is well or not from the rikishi's hair's gloss and strength. Is retirement at 65 years old? What is the typical day of a tokoyama? First thing in the morning, the tokoyama go to the heya and start making normal mage for rikishi who have bouts early in the day. Then, they make nomal mage for the rikishi who finish morning practice. Around noon, they make the Ooicho for the Sekitori-rikishi in Juryo. For the sekitori-rikishi in Makuuchi, it depends on the tokoyama's schedule. Some tokoyama make the Ooicho at the sekitori's heya, some tokoyama make it at the stadium. Anyway, all tokoyama will be attending the basho by 3:00 p.m.. Sometimes, tokoyama have to repair the Ooicho because it has been messed up during their practice. The tokoyama stay there until all the bouts have finished. After the sekitori have had their baths, we will make normal mage for them. Then, the day finishes. We go to the heya around the time when morning practice (Asa-geiko) finishes. We make normal-mage for each rikishi. Then, the day ends. There is plenty of free time (laugh). However, young tokoyama who live in the stable have a lot of work and practice to do. Does a tokoyama only take care of a rikishi's hair, or does he also have other duties? No, he doesn't. A young tokoyama has a lot of work to do, like cleaning, washing and doing a lot of chores. Some tokoyama even help the rikishi to make chanko! Do tokoyama actually "belong" to a heya, or are they sometimes "lent" from one heya to another one? Yes. As I am doing now. I go to another heya where there is no tokoyama - usually it is in the same ichimon, but occasionally, some tokoyama will go to the heya of another ichimon. It depends on the need. Who chooses the heya where a tokoyama is hired? In my case, I was brought to Isegahama-beya because my family was an acquaintance of the former Wakasegawa. It depends on the tokoyama. How are your names chosen? They are names given by the Oyakata of the stable. "Toko" comes first as my 'real' name is Tokosei. Later, some tokoyama may change their name by themselves. In future, I want to inherit the name of a tokoyama whom I admire. Do you live at the heya? When we first enter the heya, we live in the heya. When we marry, or when we have had about 10 years of experience, then we can move out of the heya. We have to have permission from the Oyakata. How many tokoyama are there currently? Is there a maximum? Currently, there are 53 tokoyama. The limit is 55. There are more tokoyama than gyoji or yobidashi, because the number of heyas has increased, and some heyas are far from Tokyo. Therefore, there is a greater need. Is there a ranking system for tokoyama, like the banzuke for rikishi? There are six ranks. The highest rank is "special rank (tokutou)" then, 1st (ittou), 2nd (nitou), 3rd (santou), 4th (yontou) and 5th (gotou). It is a system of seniority. The salary is different depending on the rank. We are promoted by years of work not by skill. To become a 2nd rank, a tokoyama needs to have worked for about 20 years. 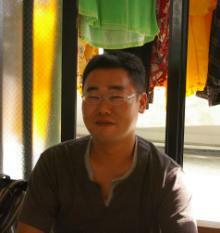 The tokoyama who is of "special rank" is usually near to retirement. Does the dress of a tokoyama depend on his ranking? No, there is no uniform. We wear casual clothes when we work. When we go to a honbasho or jungyo, we commute in suits, but we change into casual clothes when we work. What kind of "tools" or products does a tokoyama use to make a mage? Combs made from boxwood and scissors. To make an Ooicho, we also need a "magebou". 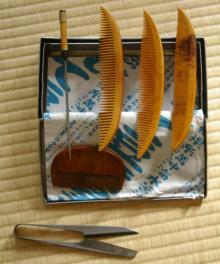 NSK provides us with these tools, so every tokoyama uses the same tools. There are four different kinds of combs - "ara-gushi", "suki-gushi", "soroe-gushi" and we also need "maekake" and "magebou" (See pictures). demonstration of chon-mage making on Kaisenryu and oicho-mage making on Kaio, by tokoyama Tokosei, as photographed by Mrs. Hotta.